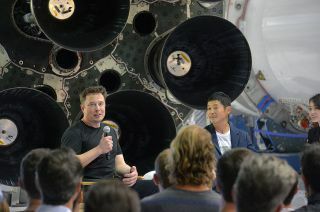 SpaceX CEO Elon Musk (at left) introduced Japanese billionaire Yusaku Maezawa as the first private passenger on SpaceX's BFR mission to the moon at a press conference held Monday, Sept. 17, 2018 at the company's headquarters in Hawthorne, California. Maezawa intends to select six to eight artists to fly with him on the lunar trip, which is targeted for launch in 2023. HAWTHORNE, California — Yusaku Maezawa has always been fascinated with the moon. A 42-year-old Japanese billionaire entrepreneur with a passion for collecting art, Maezawa wondered what masterpieces could have been created if only his favorite artists had had the opportunity to fly to the moon. Then he realized he had the ability to find out. "Ever since I was a kid, I have loved the moon. Just staring at the moon filled my imagination," said Maezawa during a press conference at SpaceX's headquarters in Hawthorne, California on Monday (Sep. 17). "That is why I could not pass up this opportunity to see the moon up close." At the same time, he did not to keep the experience to himself. "That would be a little lonely. I don't like being alone," said Maezawa. "So I wanted to share this experience with as many people as possible. That is why I choose to go to the moon, I choose to go to the moon... with artists!" SpaceX's first private passenger for the BFR ("Big Falcon Rocket"), Japanese billionaire Yusaku Maezawa, is underwriting a 2023 flight to the moon and back. Maezawa, who runs his own fashion line and whose net worth has been reported to be upwards of $3 billion, said he sees art as a way to change the world. "I thought long and hard about how valuable it would be to the first private passenger to go to the moon. At the same time, I thought about how I could give art to the world and how this could contribute to world peace. This is my lifelong dream," he explained. Maezawa first approached SpaceX to fly him to the moon using the company's Falcon Heavy rocket and Dragon spacecraft, a mission that at one time had been targeted for launch later this year until SpaceX decided to pursue development of the BFR instead. "With Falcon Heavy and Dragon, we would have had — especially for a trip around the moon — only room for two people," said Elon Musk, SpaceX's CEO and chief technology officer. "It is like the size of an SUV inside [Dragon]. If you have a five day journey in an SUV, you're going to be jam packed." On the other hand, the BFR is enormous, said Musk. With a 30-foot (9-meter) diameter, the BFS ("Big Falcon Spaceship") has enough room to accommodate 100 people, though for this first mission, Musk suggested a smaller crew. "We said maybe it is wise to have about a dozen people, or thereabouts, on the first trip into deep space," recalled Musk. "[Maezawa] very graciously offered to provide those seats to artists and cultural influencers." Maezawa does not know yet the artists he will invite, but each will be asked to create something when they return to Earth "to inspire the dreamer within all of us." "If possible, I would like to invite the top artists that represent our planet from various fields including painters, sculptors, photographers, musicians, film directors, fashion designers and architects," he said. "Luckily, we still have some time before 2023, so I hope to work very closely with the SpaceX team and reach out to each artist personally." Maezawa is hopeful the artists will want to fly to the moon with him. "By the way, if you should hear from me, please say 'yes' and accept my invitation. Please don't say no." Artist's rendering of a violinist performing in weightlessness on board SpaceX's BFS while on a journey the moon. In addition to inspiring new works of art, Maezawa's "#dearMoon" mission will also provide SpaceX the funding it needs to further develop and build the BFR. First introduced in 2016 as a solution for how to send humans to settle Mars, the BFR has undergone a series of design changes as SpaceX has sought to address the challenges associated with building a rocket capable of flying almost anywhere in the solar system. The latest version, revealed on Monday, incorporates actuated flaps or wings to control the vehicle as it flies through a wide range of atmospheric densities and velocities. "The way it operates is more like a skydiver than an aircraft," said Musk. "Almost the entire time when it is reentering, it's just trying to brake. It is just trying to stop." To date, SpaceX has completed the first cylinder section of the BFR prototype's main body and has test fired the Raptor engine that will power its launch. But there is a long way to go before a BFR will be ready to fly anyone to the moon and that work requires funding. "Funding BFR is definitely a key question," said Musk. "We have got launching of satellites, we have got servicing the space station ... and next year we will start transporting astronauts to and from the station. We have got the Starlink global broadband that we are developing, which will be a useful source of revenue. And then private customers, or any customers for BFR, [who] are incredibly helpful in funding development of the rocket." Maezawa is now the first of those private customers. "[Maezawa] is paying a lot of money — we're not disclosing the amount, but he is paying a lot of money — that will help with the development of the ship and booster," Musk said, "and ultimately, this BFR system is intended to carry anyone to orbit, to the moon and to Mars. So he is ultimately helping pay for the average citizen to travel to other planets. It is a great thing."